Using GPS technology, Yosemite’s wildlife managers can track and protect the park’s black bears. 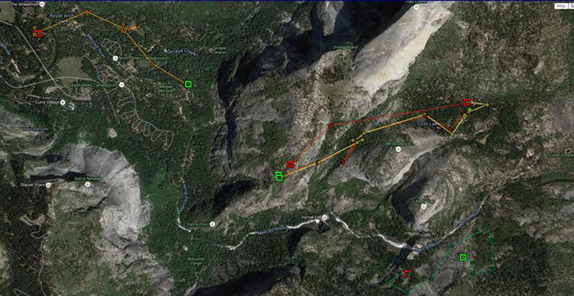 This map shows the path of four different bears near and in Yosemite Valley on May 21, 2015.
then practicalities of camping and backpacking around bears, (Food Storage , what to do if you see a bear, how bears get into cars, info for backpackers) and lots of stories about bears getting into cars, tents, camps, etc., mostly geared towards De Anza College Outdoor Club trips around bears in California and Grand Teton National park. Why don’t the rangers just move the problem bears? Yosemite National Park is home to between 300 and 500 American black bears. Despite their name, most of Yosemite’s black bears are actually brown in color. Black bears are incredibly strong, curious and intelligent animals. They are fast sprinters, agile climbers, excellent swimmers and quick learners with an extraordinary sense of smell — and a huge appetite. The average female bear weighs 150 pounds and males often exceed 300 pounds. The average lifespan is 18 years in the wild. Black bears naturally avoid humans, but when they learn to associate food with people, that behavior can change quickly, which is why vigilance and proper food storage are so important. 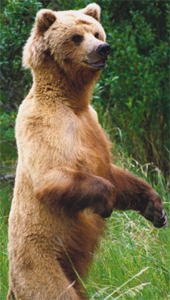 Bears see in color, have excellent night vision and hear in our normal range as well as the ultrasonic range. 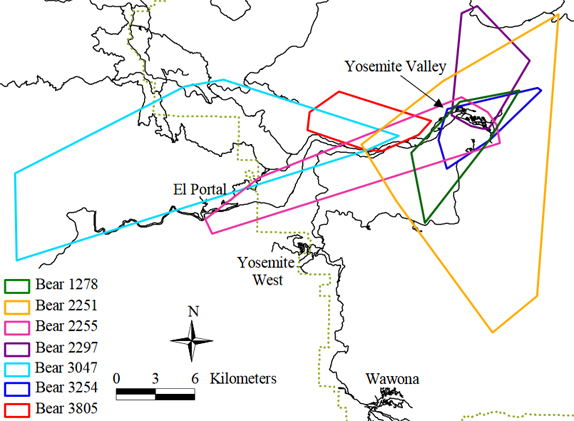 “Black bears in the Sierra Nevada usually den from mid-December into March or early April. This time period is shorter than in areas with harsher winters. “If a sow is healthy enough, she will give birth during hibernation inside the den in late January or February.” Bear milk provides three times the energy when compared to human milk and contains 30-33% fat on average compared to about 3-4% fat of human milk. “If a bear stands up and looks at me, is it acting aggressively? 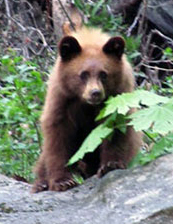 There are an estimated 350 to 500 black bears in Yosemite National Park. 10-20 of them are tagged. They can live to 20 or 30 years old. They are black bears, but are 90% brown in color (or red, blonde, black), often with a white blaze on their chest. Hibernation depends on food availability, not weather, and some do not hibernate much at all. They pick a den that is warm and dry, including even up in a hole in an oak tree. Adult males go into hibernation first and are first out. They start to go out in March. Females with cubs are the last out of hibernation. They eat 4,000 calories a day. They are incredibly quiet when walking and can sneak up and get food off a picnic table that people were sitting at. Injuries to humans include at night when unloading food into the campsite bear box, and the doors are open, and the person gets swatted by a bear that snuck up on them. More human food = more tooth decay. A well fed mother might have 3-4 cubs. Her body delays implantation and her body knows how many she can have. A sow not well fed might have only one cub or none. There might be cubs from different fathers in one birth. Black bears are string enough to bend open an improperly latched bear box door. Bear “bells” do not work at all well compared to a human voice. They don’t carry over streams, wind as well. Report all incidents and sightings. If you have the presence of mind in all the excitement, try to notice if the bear has a tag, the color of the tag and the number on it. Black bears may prefer minivans, either for easier access or because they often carry food-spilling children in them, causing more food odors. 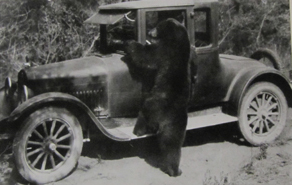 Setting your car alarm will not keep a bear from breaking into your car, it will just wake up everyone in the campground when the bear gets in. 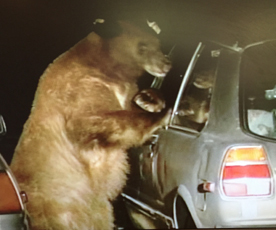 Leaving your dog in the car will not scare off the bear. One morning at the Yosemite Ahwahnee (Majestic) Hotel, a bellman found a car broken into by a bear the night before. 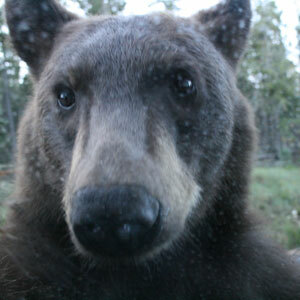 An empty ice chest had been showing (and smelling to a bear) through the back window. The large family dog was cowering and whining under the steering wheel column. 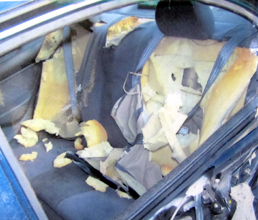 One bear was not breaking windows, it learned how to open car door handles, and the park recommended locking car doors (as well as removing and properly storing all scented items, etc.). One who let himself in by opening an unlocked door became trapped in a car and was found sleeping on the back seat in the morning, but most who get stuck inside panic and tear up/destroy the vehicle interior trying to get out, including setting off side air bags and getting even more panicked. 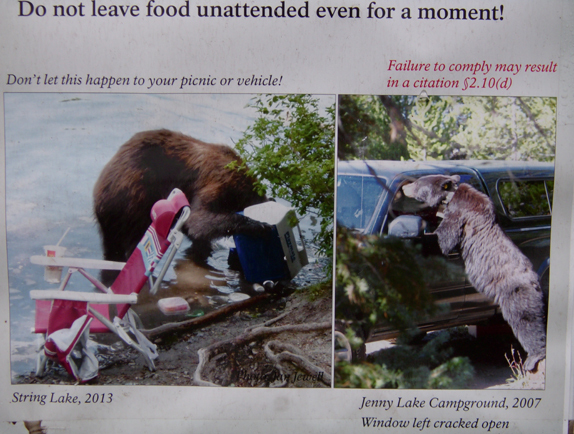 “Six vehicles were damaged by a bear in the Curry Village area last week, all vehicles contained food. 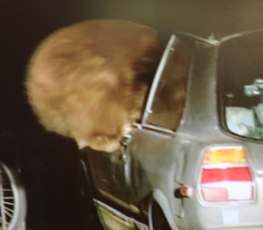 Bears broke in to twenty vehicles last week, many containing a significant amount of human food. 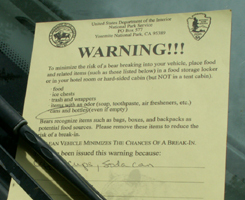 Most of the damage occurred in the Curry Village parking lots and at the Ahwahnee Hotel. 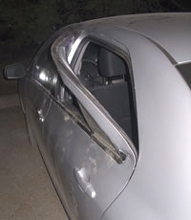 At times in the 1990s, 10 to 15 cars would be ransacked in a night. 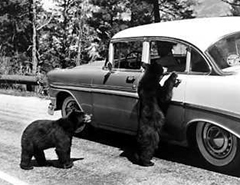 In 2000, bears broke into more than 300 cars, smashing windows, clawing doors open and ransacking the interiors, (according to the San Francisco Chronicle). Before the trip (you can’t trust your own nose); look around the car, including under the seats, thoroughly, for that dried up french fry or stick of gum that fell under the seat. Take the gum wrappers out of the ashtray. Hey, no heavily scented air fresheners hanging from the rear-view mirror! Puuuuuulease get rid of the dashboard hula girl that emits the pina colada scent, (only $2.99 at the Frys one day Flash Sale and you couldn’t resist). The child seat has food spilled on it, but scrubbing it before the trip might not be enough. You might need to try to clean it and then leave it sitting out, perhaps on the picnic table overnight. Remove night crawlers and salmon eggs from the fishing gear. No bottle of brake fluid or spray can of deicer showing, the bears don’t know it’s not food and will break into your car because they see an item the shape of a food container. Bears have an incredible sense of smell and are able to smell things 3 miles away. Air out your car if you eat burgers on the way to the park. Lock your vehicle doors. Some bears have figured out how to open doors at the handle the same way you do. Bears can get into locked rooftop car storage pods. “Bears have a voracious appetite. They also are incredibly curious and have an amazing sense of smell. This combination sometimes leads them to look for our high-calorie food. Sometimes bears that routinely get our food become aggressive, and sometimes have to be killed as a result. By storing your food properly, you can prevent a bear’s unnecessary death. “Food” includes any item with a scent, regardless of packaging. This may include items that you do not consider food, such as canned goods, bottles, drinks, soaps, cosmetics, toiletries, trash, ice chests (even when empty), and unwashed items used for preparing or eating meals. All these items must be stored properly. How to Store Your Food . . .
Food lockers are available at every campsite, Housekeeping unit, Half Dome Village (Curry Village) tent cabin and at nearly all trailhead parking areas. You must store all your food in food lockers. 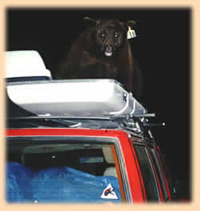 Bears may enter campsites even in your presence, and some will even check lockers to see if they’re latched. Keep your locker closed and latched at all times, just like you would a freezer. Only have the food out that you are actually using; if you’re not using it, put it back into the food locker. Finally, treat your trash like food: keep it in your food locker or dispose of it in a bear-proof dumpster; do not leave it sitting out. Food lockers are available at every campsite, Housekeeping unit, and Half Dome Village (Curry Village) tent cabin. Food may be stored out of sight in hard-sided trailers and RVs, as long as windows, doors, and vents are closed when you’re not there. 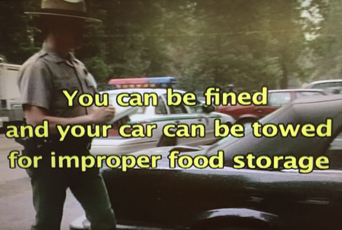 Food may not be stored in pop-up or tent trailers, or other soft-sided campers. You must keep all food inside your room; if you are not in the room, the windows and doors must be closed. Bears can easily break into cabins through an open door or open window. Always keep your food within arm’s reach and don’t turn your back to your food; never leave food unattended. 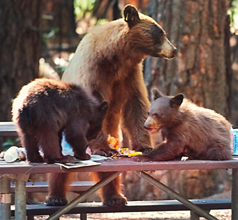 Bears may investigate picnic areas or backpacks for food even in your presence, so be alert. 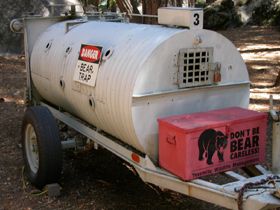 Bear resistant food containers (“bear canisters“) are required for overnight hikers throughout the Wilderness (counterbalance food hangs are no longer legal). In Yosemite and the southern Sierra, bear canisters are the only effective and proven method of preventing bears from getting human food. If animals get anything from you, NEVER try to get it back from them until they abandon it. Immediately clean up any scattered garbage or food. 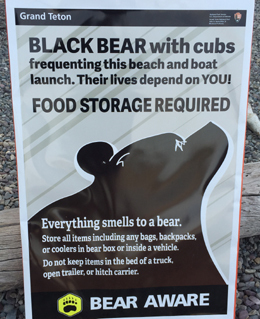 Especially after dark, don’t turn your back on food and don’t leave a bear box in a campground open beyond the time it takes to get out what you need. If you arrive after dark, keep someone with the gear in the back of the pickup until you can unload and store it properly. At the very least, raccoons might be climbing into the back of the truck. At bedtime, double check pants/jacket/day pack pockets for spare chocolate bars. At bedtime, use a flashlight (electric torch) to check under the picnic table for lost potato chips and cooking items you forgot you set down on the ground during cooking. 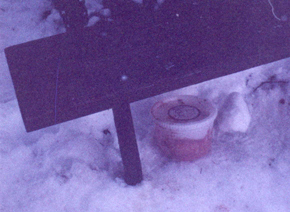 Below: a cook set down a container of pasta sauce under a picnic table bench on one of our winter trips and forgot about it. We found it with a quick flashlight sweep before we all moved to the campfire. Please use the clip on the trash bin to lock it. If a bear gets into a dumpster on a hot day it can be a death trap. If you notice one is un-clipped, please clip it. Immediately report it to a ranger or campground host if the clip is missing from the dumpster. FAQ: How can I keep bears or coyotes or raccoons or … animals out of my campsite? A bear may enter your campsite day or night, even in the presence of many people, dog(s) even large ones, a big campfire or lots of lights, even motion sensor lights. Running your vehicle engine or generator, playing loud music, motion-activated sound systems simulating a barking dog, trying various ‘repellents’ (mothballs, an open bleach container, pine-scented cleaner, fabric softener sheets or ammonia soaked rags hanging everywhere, dog or cat in-the-garden repellent, etc.) will not work. Trying to set an alarm (pots and pans on top of a cooler, for example), might wake you up when a bear investigates the cooler, but will not give you enough time/any way to keep the animal from getting the food. In Yosemite National Park, it is prohibited to possess or use pepper spray (including bear spray and other irritant gas devices), including ones you might have purchased for a trip to a park in the rocky mountains. You may not see a bear during your visit because bears naturally avoid people. If you do see a bear, what you should do depends on the situation. In any case, always let a ranger know or leave a message at 209/372-0322. If you are in a developed area (e.g., campground, parking lot, lodging area) or if a bear approaches you, act immediately to scare it away: make as much noise as possible by yelling very loudly (don’t worry about waking people up if it’s nighttime). If you are with other people, stand together to present a more intimidating figure, but do not surround the bear. Bear spray/pepper spray is not allowed in Yosemite. The intent is not to harm the bear, but to scare it from the area and restore its natural fear of people by providing a negative experience. If you see a bear anywhere else, keep your distance (at least 50 yards, or about the distance four shuttle buses parked end to end would take up). If you get closer, you will be helping the bear become used to being around people. Bears that become comfortable around people lose their natural fear of us and sometimes become too aggressive; sometimes they then have to be killed. When a ranger sees a bear, the ranger may use non-lethal aversive tactics to chase the bear out of a developed area. During your overnight stay, expect to see and hear rangers patrolling public areas for bears. You may hear rangers yelling at and chasing bears. You may also see or hear rangers shooting noisemakers or non-lethal projectiles (such as rubber slugs from a shotgun or clear paintballs from a paintball gun). The intent is not to harm the bear, but to scare it from the area and restore its natural fear of people by providing a negative experience. NOTE: These regulations and precautions help decrease the chance of personal injury or property damage. However, bear damage and confrontations are still possible even when all of the above guidelines are followed. Failure to comply with these regulations may result in citation and/or impoundment of property. (If you act to to scare a bear away, give the bear a wide, w i d e path to run away). Don’t do any of this if you are between a mama bear and her cub(s), or more importantly, NEVER get between mama and her cub(s). 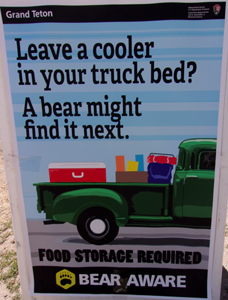 Bears hibernate all winter, so food storage isn’t as important then, right? WRONG. The bears don’t truly hibernate all winter in mild winter places like Yosemite and the food storage rules are in effect all year. We saw bear tracks in the snow in Yosemite on a January Ranger snowshoe walk, and one broke into a car (not one of ours) in Feb. 1999. (And there have been other winter break-ins we might not personally have heard of). Plus, the raccoons and coyotes are everywhere in the campground in winter, especially at night. Raccoons know how to unzip tent doors. Photographers – if an animal notices you, you’re too close. There is a lot more at: Backpacking Advice, including thunderstorms, menu ideas and no-cook backpacking food, ways to keep down on weight and more. Again, “counterbalance food hangs are no longer legal” in Yosemite and many other parks. Where they are still allowed, we don’t use that method. We can all figure that bears everywhere will eventually figure out how to get suspended food, so why be the first people to experience it at a park where they now allow counterbalance hanging or even have poles set up to use? “Two yearlings are approaching visitors for food on the trail to Half Dome. Think you can outwit the bears by using some other method or other bear resistant container design than the approved containers? If you try and fail it could mean the bear will keep on trying to get human food and may have to be put to death. Zoos don’t want them and when the park tries to relocate them the mostly come back to where they found easy human food sources, or die trying to. Bears are very smart animals. 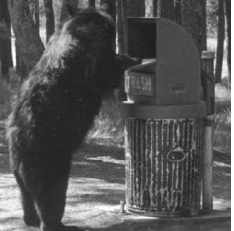 The bear ‘proof’ garbage bins have been redesigned many times by the park service. Bears have been used in circuses around the world because of their brains and gymnastic abilities. In backpacking areas some have been known to keep up the circus tradition by climbing on limbs above a suspended food bag and leaping to snag it with their claws on the way to the ground, so hanging food is no longer allowed in Yosemite and many other camping areas. Rock climbers occasionally report that bears pulled up food bags they hung over sheer rock cliffs. Bears don’t mind water and have swum out to a raft people thought they could hide food on . At the top of the stairs at the beginning of the portage trail from Leigh Lake to String Lake in Grand Teton park there’s a bear box (standard metal footlocker style) with a sign on it reminding people to put all their food in it while they carry their canoe/kayak down the trail instead of leaving food sitting out unprotected. 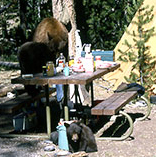 On a trip a few years back in Grand Teton the rangers were prohibiting picnics in one popular area because a mom bear was teaching her cub to bluff charge picnickers to scare them away from their food. 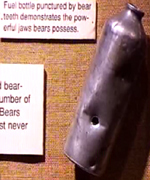 Below, a picture of a display in Grand Teton showing a fuel bottle with hole where a bear bit into it. “Food Storage while Climbing in Yosemite. Bears actively seek food left by climbers at the base of climbs. Do not leave any food, drinks, toiletries, or trash at the base of the wall. All food must be stored in an allowed bear canister or hung well up the cliff face (if you can reach food without climbing gear, so can a bear). Each year, bears rip into numerous haul bags and packs at the base of various climbs. Every time they get food from a haul bag or backpack, they become more conditioned to human food. Help us break this cycle! Store all scented items properly at all times! Never stash food unless it is properly stored: either in an allowed bear canister (available for rent at any wilderness center for $5) or hung well off the ground on vertical rock. If you can reach your food (or the rope tying it off) without climbing gear, it is not stored properly. 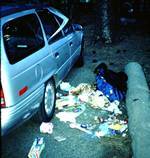 Remove all food, drinks, toiletries, and trash from your car. Food lockers are available at the El Capitan Picnic Area (Manure Pile) and on the south side of El Capitan Bridge. Please do not lock these shared lockers. If you leave food in a bear box near a trailhead or climb, please leave a note attached with your intended dates of storage so a Ranger won’t clean is up when it looks like it has been abandoned. 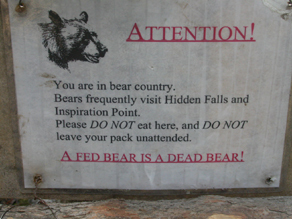 Each trailhead should have some bear boxes (food lockers), except as noted in the charts. In the last month, we moved 4 yearlings to various locations outside of the Valley (but inside the park). They were moved in an effort to help them establish home ranges full of natural foods, rather than remain in Yosemite Valley where they are in close proximity to many sources of human food. So far these bears have not returned to the Valley, although they have traveled quite a bit. 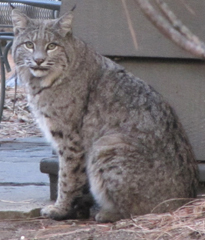 As a contrast, we moved an adult female this week that had already established her territory in the Valley. She returned in two days! This is why we rarely move adult bears-it’s a lot of work and they come back almost faster than we do. “Approximately 80% of relocations of adults fail. The failure comes in many forms. Most bears just return and continue to seek out human food. Some bears wander outside of the park boundaries and cause problems in places that are not equipped the bear proof facilities we have in the park. When this happens, they are often destroyed by California Fish and Game. Also, bears can wander outside the park boundary and be hunted. Finally, the bear population in California is very healthy, so when you move a bear, it is likely there is already a bear in that area that knows the good food sources. The new bear is forced to compete for a limited food source in a place it’s never been. In my latest visit to Yosemite this weekend, I’ve concluded it’s unlikely the bear problem will ever be solved here. 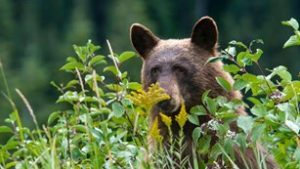 There were 13 more bear incidents reported in the past week, bringing the total to 60 already for the spring season, up 97 percent from last year. You probably know why, of course. It’s always been a people problem, not a bear problem. For most park visitors, the bears resemble cartoon characters; seeing one validates the vacation. 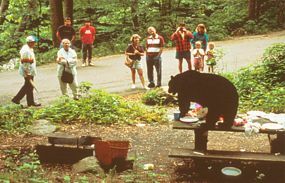 I’ve seen experienced campers on their last night leave out an open tub of butter on a picnic table to entice a bear into their camp, impress the family and get pictures. Hey, if you were a bear, what would you rather eat? Grass, ants, termites and bugs under rocks, or a tub of butter? At Yosemite, Yogi is definitely smarter than your average bear. Bears learn quickly each June that they can just amble into a campsite at about 8 p. m., merely glance at the day’s newly arrived campers, elicit shrieks and shouts and then nab any leftovers sitting out. …Then there is the story of the tourists from Europe who didn’t think it was so funny. 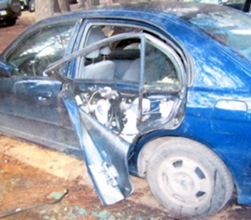 This was in Wawona in south Yosemite, where the four tourists charged into the ranger station, shouting in hysterics that their “rental car had been bombed by terrorists.” The proof, they said, was the “powder residue from the explosive” all over the back seat. Rangers examined the crime scene and discovered that the “powder residue” was actually pancake mix — along with a paw print in the middle of the back seat. In Yosemite, some raccoons have learned how to open tent door zippers. 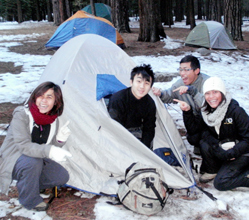 Early Saturday morning on the De Anza College Outdoor Club 2013 winter Yosemite trip we found a torn open pack sitting just outside the entrance to one of the two-person tents. A raccoon had opened the tent and dragged it out, not even waking the people inside. In the second photo, the camper, not knowing how his pack got there, was concerned that perhaps his camera had been stolen, but that was not what the raccoon wanted. In the foreground of the third picture you can see the yellow chocolate bar wrapper (he and the raccoon share a liking for Toblerone bars). Yes, everyone had been asked to triple check their day packs, pockets, etc., before putting gear in their tents. Yes, this has happened more than ce. On the 2010 winter trip a guy put one of those suitcase mini-locks on the zipper pulls of his tent, thinking that it would keep a raccoon out. The raccoon just tore the tent fabric instead. 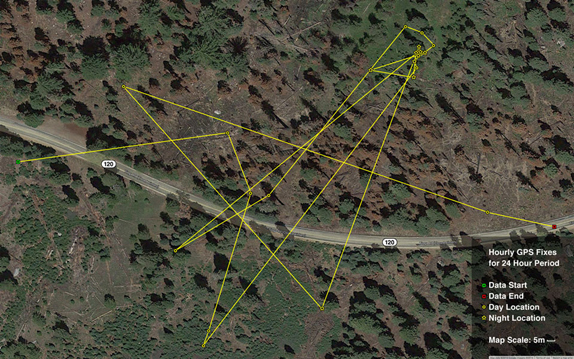 and How to not collide with a deer (or with a bear) with your vehicle. Yup, you might guess that doing the speed limit could be the most important thing. MOOSE, WY- Two visitors to Grand Teton National Park were recently cited for illegally feeding wildlife within the park. On Thursday, October 4, visitors in two separate vehicles along the Signal Mountain Road were observed feeding fruit to three black bears. The bears, a sow and two cubs of the year, each received several food rewards during the incident and made contact with several vehicles along the road. The maximum penalty for feeding park wildlife is a $5,000 fine and up to six months in jail.